Architect A. van der Steur's original Haarlem concert hall dating from 1872 has been fully restored and expanded from one to five auditoria. The new portion stands on the site of the old Enschedé printing works. Given the shortage of space, the design brief was an intricate three-dimensional puzzle. A key element in the ensemble is the central foyer drawing together old and new portions and from which the routes to the different auditoria begin. It is also where the various materials - old brickwork, new glass and timber - come together. 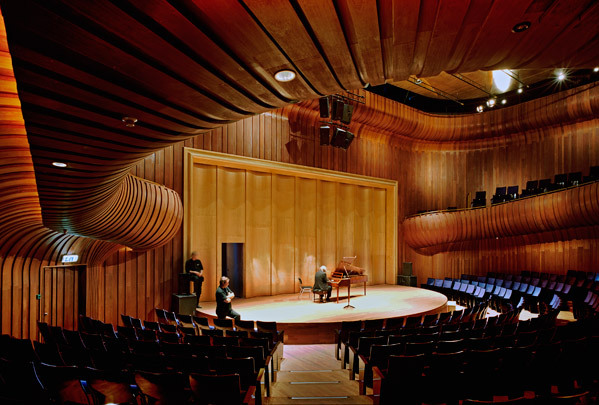 The interior of the new Small Hall consists of organically curved and deflected forms in reddish brown timber. Parts of the facade of the new-build portion have a cladding of glass screen-printed with a pattern developed in association with the graphic designer Karel Martens.